Elizabeth City, NC Bojangles'® Tands, INC. Store #30 - Bojangles'® / Tands, Inc.
With our flaky buttermilk biscuits, crispy fried chicken and southern-style fixin’s — you can’t go wrong at Bojangles’® in Elizabeth City, NC! Bojangles’® is your spot for fast, delicious food at affordable prices. The Elizabeth City Bojangles’® is open all day and offers great menu options for breakfast, lunch and dinner. When your stomach starts growling, it’s Bo Time! 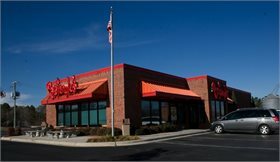 The Elizabeth City Bojangles’® is located near the Elizabeth City State campus and the Coast Guard, and it is a favorite place to eat for students, military personnel, and the whole community. Swing by Bojangles’® in Elizabeth City, NC on Monday nights from 5-7 pm to play bingo!